The detailed pathway for the biosynthesis of pyrrolysine - the 22nd and latest amino acid to be discovered - has been outlined by US researchers. The results show that each pyrrolysine is made from two lysine precursors, pointing towards a route by which new amino acids could have been introduced into the genetic code during evolution. There are 20 common amino acids that are widely recognised as making up all proteins. These are known as the canonical amino acids. But protein synthesis is more flexible than we once thought. And while synthetic biologists have realised it is possible to expand the language of the genetic code by introducing amino acids of their own design, we are still - albeit infrequently - coming across rare but completely natural amino acids beyond the canonical 20. Pyrrolysine is the latest, discovered a decade ago in methane-producing archaea (ancient lifeforms related to bacteria). Krzycki's team transferred genes for pyrrolysine production from archaea into Escherichia coli bacteria and then used stable isotope labelling and mass spectrometry to trace the path of 'heavy' lysine precursors. They saw that the bacteria incorporated the heavier carbon (13C) and nitrogen (15N) isotopes to form heavy pyrrolysine. 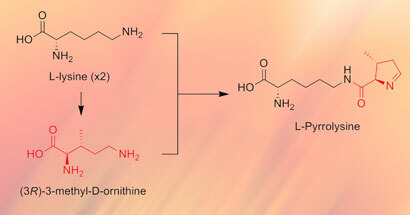 Their results also indicated that lysine was most likely converted to pyrrolysine via an ornithine derivative, in reactions catalysed by enzymes encoded in the gene cluster they had introduced. According to Krzycki, the pathway his team uncovered fits with the so-called coevolutionary theory for how the genetic code evolved. 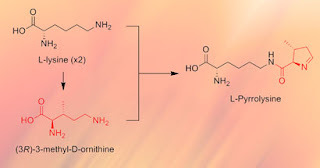 Under this theory, there were only a few amino acids to begin with, but new amino acids could be synthesised from existing ones. 'This would kind of fit with that - that pyrrolysine is now coming from lysine and lysine is derived from aspartate,' he says. The real significance of the work, says Dieter Söll, a molecular biochemist at Yale University in Connecticut, is that it shows in detail what is required to add a new amino acid to the genetic code - as pyrrolysine's biosynthetic pathway likely represents its origin. 'It is exciting to learn from nature such a simple and elegant scheme for introduction of new amino acids into the genetic code,' Söll says. He also thinks the pyrrolysine scheme for introducing new amino acids into the genetic code is one that scientists could imitate using their own designs - and he is 'convinced' they will try. Low levels of radiation have been detected on planes arriving at US airports from Japan, but experts say that overly sensitive detectors are culpable and the public should not be concerned. 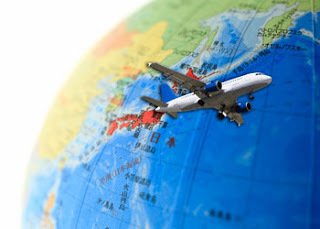 The US Department of Homeland Security (DHS) is monitoring maritime and air traffic from Japan closely in response to the ongoing nuclear crisis. On 16 March, two American Airlines planes arriving from Tokyo tested positive for low-level radiation - one in Dallas, Texas, and another in Chicago, Illinois. But in both cases commonplace explanations were found: a routine medical shipment in a cargo compartment and medical equipment inside an empty cargo container. Both planes were quickly put back into service. American Airlines spokesperson Tim Smith says the radiation detected on its flights was 300 times lower than levels emitted during one chest x-ray. According to the US Department of Energy (DOE), a typical chest x-ray produces 0.1 millisievert (mSv) per image. US federal guidelines call for public health action for exposure exceeding 10 mSv over four days. DHS Customs and Border Protection (CBP) says that no aircraft entering the US from Japan has tested positive for radiation at harmful levels. The monitoring represents 'an abundance of caution', it adds. Frontline personnel at airports are equipped with personal radiation detectors (PRDs), and all airports have radiation isotope identification devices (RIIDs), which are more sensitive and detect radiation as well as determining its type. The agency would not give details of how the detectors work, however, or the composition of the materials that they detect, citing reasons of national security. CBP points out that radiation is all around us - from commodities including marble, granite, bananas and medical isotopes. The agency had 580,000 radiation alerts in 2010, and all were deemed harmless. Radiation experts also dismiss the recent alerts, claiming that the detectors are overly sensitive. 'If you look you will find, but that's a testament to the sensitivity of the radiation detectors, and not to any public health concern,' says David Brenner, who directs the Columbia University Center for Radiological Research. Nuclear expert Jay Lehr, science director of the Chicago-based Heartland Institute, agrees. 'In many ways the instrumentation has worked against us in creating fear where there should be no fear,' he tells Chemistry World. There is 'absolutely zero possibility of health risk' from any radiation carried on a plane from Japan, he adds. 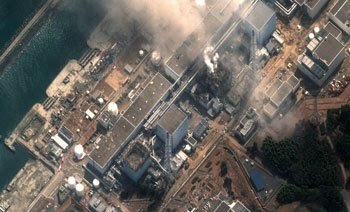 Brenner points out that iodine-131 has a half life of 8 days, and within a few weeks the levels emitted from the damaged Fukushima Daiichi nuclear plant will have decayed away. 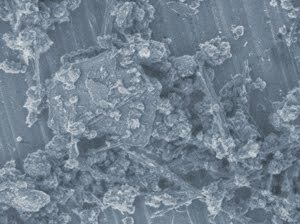 Compared with control experiments, in which non-antibacterial clay was dispersed in water with E. coli, the concentration of iron inside the bacteria near to the antibacterial clay was eight times higher. Williams's group therefore says that iron is the 'primary reactant' in the antibacterial process. They believe that Fe2+ ions overwhelm the bacteria's outer membranes, oxidising inside the cells to produce lethal hydroxyl (OH) radicals. A potential non-invasive method to detect endometriosis by acquiring a spectral signature of the uterus has been developed by scientists from the UK. Francis Martin from Lancaster University and colleagues used infrared spectroscopy together with computational analysis to analyse the difference between uterine tissue affected by endometriosis and normal tissue in the uterus. 'Endometriosis [the growth of endometrial tissue outside the uterus] affects about 10 per cent of young women and can be associated with severe abdominal pain and could result in cancer,' says Martin. 'Currently, there is no non-invasive means of diagnosis; it is done by laparoscopic surgery,' Martin adds. Martin and his team analysed uterine samples from hysterectomy patients. They compared endometrial tissue growing outside the uterus with the endometrial tissue within the uterus using infrared spectroscopy to give a biochemical-cell fingerprint for each sample. They also compared the samples to tissue from endometriosis-free women. 'These IR spectra can then be processed using computational algorithms that allow one to quickly visualise the data to determine which spectra are similar or dissimilar to each other. Consequently, one can determine the normal tissue IR spectra and those outside this range may be determined as atypical,' explains Martin. 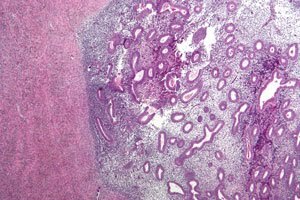 The team found that endometriotic tissue possesses a unique spectral signature and, more importantly, that the uterus of women with endometriosis express a signature distinct from that of the non-endometriotic uterus. Martin hopes that the technique can be used on samples that can be obtained directly from patients in a non-invasive way. 'Screening cytology from the cervix is already well established. It is also possible to obtain cytology in a similar fashion from the uterus, or even small biopsies,' he says. He adds that cases of endometrial cancer are on the rise and this approach could be used as a cancer screening tool. 'Over the last few years, a great amount of work has been carried out to study cancer with Fourier Transform infrared (FTIR) spectroscopy. However, it is also important to apply this technique to the study of non-malignant diseases such as in this work,' says Josep Sulé-Suso, an expert in oncology from Keele University. 'The combination of FTIR spectroscopy with available diagnostic procedures for endometriosis should help in understanding the causes of this disease, leading to the development of effective therapies,' he adds. AB contains about 20 per cent hydrogen by weight and can release over two equivalents of molecular hydrogen per molecule. As it does this it forms a polyborazylene (PB) polymer residue. According to Sutton, AB is a good potential hydrogen storage material because it is stable at ambient temperature and doesn't require external cooling to keep hydrogen in or high temperatures to evolve hydrogen. 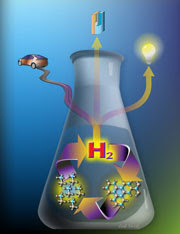 But for AB to controllably deliver hydrogen and be used commercially it must be regenerated from PB. The University of Oxford's Martin Jones calls this the 'the most significant problem associated with using ammonia borane as a hydrogen storage material'. Now, the LANL team and researchers from the University of Alabama show that hydrazine in liquid ammonia can almost quantitatively regenerate AB. The idea is that this regeneration would be centralized and at an industrial scale, not aboard individual vehicles, notes Sutton. Jones, who has worked with the International Partnership for the Hydrogen Economy, notes that AB is just one of several materials that show 'high promise' for hydrogen storage. 'Other issues remain, but this certainly places it high on the list of materials that might, in time, find commercial applications,' he says. As workers battle to cool down damaged Fukushima Daiichi nuclear power plant reactors after the devastating earthquake and tsunami that struck Japan on 11 March, the potential environmental impact from the release of radioactive material remains uncertain. Already political fallout from the disaster has spread to Europe and will no doubt have a lasting impact on nuclear power policy and research funding. Four days after the earthquake, German chancellor Angela Merkel announced that seven nuclear power plants, that began operating before 1980, will be shut down for safety review until at least June. The closures reverse a controversial decision made last year by Merkel's coalition government to extend the life of older nuclear power plants. And France, where nuclear power provides 80 per cent of total electricity supply, announced safety tests on its 58 reactors. The Japanese people are highly appreciative of the global outpouring of support and sympathy in the wake of the earthquake, he says, adding that the embattled nation will persevere. Vaccines made in China will now be supplied through United Nations (UN) agencies to developing countries, after recognition from the World Health Organisation (WHO) that China's State Food and Drug Administration (SFDA) has complied with international standards for vaccine regulation. 'It is a validation of the capability of the Chinese regulatory authority to ensure that vaccines released onto the market are of assured quality,' says Michael O'Leary, a WHO China representative. According to the SFDA, China has 36 vaccine producers that collectively produce 49 vaccines for 27 diseases, with an annual output capacity for up to one billion doses, most of which are cheaper than their domestic counterparts. For example, the price approved by China's National Development and Reform Commission for the combined measles, mumps and rubella (MMR) vaccine, is Yuan20.8 (US$3.2) per dose. 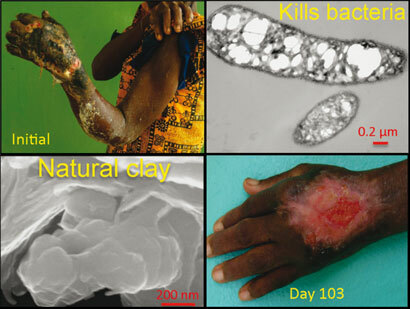 This is only one fifth of the price approved by the US Centre for Disease Control and Prevention (CDC). 'The WHO's approval does not mean that previously China did not have a well regulated vaccine industry. It is mainly a precondition to enter the international market,' says Liang Xiaofeng, director of the national vaccination office at the China CDC. To Liang and his colleagues, the acknowledgement may reduce public mistrust of domestic vaccines after widespread reports of several vaccine related scandals and accidents, which have posed a serious challenge to China's national vaccination campaign. In March 2010, the problematic vaccine logistic system in Shanxi Province was blamed for causing the sickness and deaths of more than 100 children. Though the government denied the link, public confidence has been seriously eroded, and together with reports of sub-standard rabies vaccines in May 2010, there was less compliance from the public in a nationwide vaccination campaign to eliminate measles in September 2010. 'The WHO approval will help domestic vaccines to regain public trust, benefiting the industry,' says Liu Peicheng, a spokesperson of Beijing Sinovac, which has developed the world's first vaccines for SARS (Severe Acute Respiratory Syndrome) and the H1N1 strain of influenza. The acknowledgement on China's regulatory system is a precondition that could lead to the UN purchasing individual vaccines from Chinese vaccine makers. For this to occur, the manufacturers have to pass the approval for China's new version of GMP (Good Manufacturing Practice) for the Chinese pharmaceutical industry that was released at the end of February. 'As well as the new GMP, the acknowledgement and the subsequent approval of individual vaccines will certainly help strengthen our industry,' Liu tells Chemistry World. 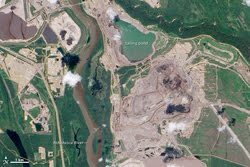 Researchers in the UK and Canada have identified for the first time some of the individual components of toxic naphthenic acid mixtures present in waste water from oil sands. Oil sands are large natural deposits that contain sand, clay, water and bitumen - an extremely viscous form of petroleum. Separating the bitumen from the sand requires an extraction process that uses large amounts of water - between two and four barrels of water for each barrel of bitumen - producing large volumes of toxic waste water. These latest findings could help understand the toxic naphthenic acid (NA) mixtures in that waste water. The findings boost the prospect of improving much sought after environmental monitoring programmes. The Athabasca oil sands in the Canadian province of Alberta are the world's largest oil sands and represent some 174 billion barrels of bitumen that can be turned into synthetic oil. The waste water generated is either recycled back into the processing or stored under a 'zero-discharge' policy in large lagoons called tailings ponds. 'Identifying individual components within this mixture has proven quite difficult because of the similarities between structural conformations, as well as the sheer number of compounds contained within the acidic fraction of oil sands process-affected water,' says Richard Frank at the Aquatic Ecosystems Protection Research Division of Environment Canada, Burlington, Ontario, who conducted the research with Steven Rowland's lab at the University of Plymouth, UK. Using two dimensional gas chromatography and time of flight mass spectometry, the team studied methyl ester derivatives of oil sands process water (OSPW) acid-extractable matter. The chromatographic method gave a high enough resolution of hundreds of the components, enabling the mass spectral identification of numerous tricyclic diamondoid acids, which the team suggests is indicative of significant biodegredation. Since toxic action is frequently determined by structure, identifying the NA structures in the OSPW is crucial. Not knowing the structures has made it difficult to monitor the potential leaching of NA from tailing ponds into surface waters. Furthermore, the oil sands are known to leak naturally into the environment, so there is a need to differentiate between industrial and natural contaminates. 'The advancement of naphthenic acid analysis presented in this study will allow for a better understanding of the complexity of this poorly understood mixture,' says Frank. Two separate groups have looked at the explosive potential of nitrogen compounds but while one group made an incredibly explosive compound, the others have developed a safer synthetic route for tetrazoles. 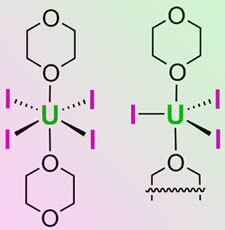 In Germany, Thomas Klapötke and Davin Piercey of the University of Munich hoped to make a green alternative primary explosive using a chain of 10 nitrogens. However, the new compound is much more explosive than anticipated and can only really be of interest for refining models. Currently, lead azide is used to initiate large amounts of secondary explosives like dynamite but it has the unfortunate side effect of being toxic. Klapötke and Piercey have been trying to find green/non-toxic replacements for lead azide and were inspired to investigate long-chain nitrogen compounds by a surprisingly stable eight-nitrogen compound. The pair hoped that a 10-nitrogen chain compound would be slightly more sensitive. 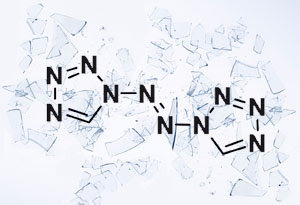 However, the bis tetrazole joined by an azo linkage proved to be so explosive that the dry compound easily exploded, destroying glassware and setting off further explosions as glass shrapnel hit other samples of the compound around the lab. 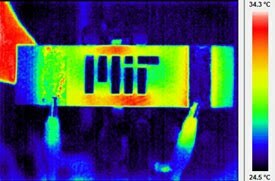 Timothy Jamison at the Massachusetts Institute of Technology, Cambridge, US, describes the molecule as 'really impressive'. Jamison has recently developed a flow reactor that makes the manufacture of tetrazoles (the precoursors of Klapötke and Piercey's compound) safer and thinks that he could in theory make the 10-nitrogen compound using a modified system although given the compound's sensitivity 'we probably won't'. As well as being used to make explosives, tetrazoles are used in many industrial applications, from catalysis to medicinal chemistry. The problem is that tetrazole manufacture can itself be explosive as hydrazoic acid is produced. Jamison has bypassed this problem by using flow so that there is no place for any hydrazoic acid to collect. With this approach, Jamison can use high temperatures and pressures to produce high yields of tetrazoles using chemistry that would otherwise not be viable. As Jamison investigated the process further he found that it could be made simpler to run and scaled up to an industrial scale. 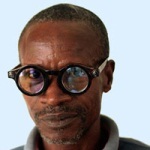 He has shown that scaling up the process by a factor of 10 should yield around 40 kilos of product annually, which he suggests would be enough for a global supply of some products. This is Jamison's first bit of tetrazole chemistry, but his interest in tetrazoles grew out of a collaboration with Novartis. Now that he has developed an interest in azide chemistry in general, Jamison's group is looking to develop some other azide reactions using flow. Jamison's flow method would not necessarily help Klapötke and Piercey's work, since their compound is mainly dangerous when dry. But Pierecy does suggest that the flow reactor would be 'very useful' for the manufacture of tetrazole precursors. The first new treatment for lupus erythematosus in half a century has been approved by the US Food and Drug Administration (FDA). Benlysta (benlimumab) is a monoclonal antibody that was developed by US biotech Human Genome Sciences from antibodies provided by Cambridge Antibody Technology in the UK, and commercialised in collaboration with GlaxoSmithKline. It acts against B-lymphocyte stimulator, a protein that is thought to increase production of white blood cells that attack healthy tissue, and which is present in elevated levels in lupus patients. 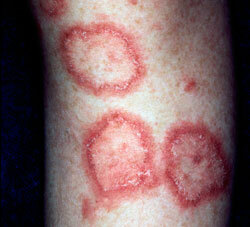 The cause of the autoimmune disease is unknown, which has made it difficult to find a target for drug treatment. Current therapy relies on preventing flare-ups of the disease occurring, and reducing their severity and duration when they do. Many patients rely on steroids, and also take drugs designed to treat rheumatoid arthritis, another autoimmune disease, and even antimalarial drugs - the last drug to be licensed for lupus, in 1955, was the antimalarial plaquenil (hydroxychloroquine). Analysts are predicting blockbuster status for the drug - annual sales of anywhere between $3 million and $7 million (£1.9-4.4 million) have been estimated, with the annual price per patient expected to be around $35,000. But it is not the solution for all lupus sufferers. It does not work in all forms of the disease, and while Phase III trials showed an improvement in patients given the antibody on top of standard therapy, it remains unclear whether it actually reduces the number of severe flare-ups. It also appeared to be less effective in black patients, in whom the incidence of lupus is higher, and further trials will be carried out in this group. 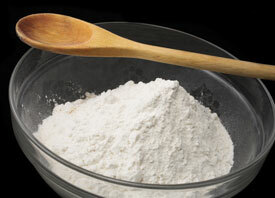 After strong public pressure, China will ban the use of wheat flour whiteners in May. Although analysts say the ban will not affect other food additives in the short term, the policy may hamper research and development (R&D) in the field. Whiteners to be banned include benzoyl peroxide and calcium peroxide, which whiten flour through oxidation. When ingested in large amounts, the chemicals are harmful to the respiratory system and can cause sensitisation. On 1 March, the Chinese Ministry of Health, together with six other ministries, released a notice to withdraw food additive licenses for benzoyl peroxide and calcium peroxide and ban their production and application as food additives. 'The debate on four whiteners has lasted for more than 10 years. Although at the current maximum level there is no clear evidence to prove their harm, the government takes a low-risk principle to ban its uses,' says Dong Jinshi, director of the Beijing Kaifa Environment Protection Technology Centre. In China, the legal level of benzoyl peroxide or calcium peroxide as additives is no more than 60mg/kg, which is much lower than international levels - for example in Canada the legal level is 150mg/kg. But despite the low maximum level in China, the rule is often broken by flour manufacturers because it doesn't whiten the flour effectively. 'Actually, the additives are seriously abused. Chinese producers and consumers like the white colour too much,' says Yu Jianping, a manager of Shanghai Yiyuan Company, a leading food additive developer. In December 2010, 90 per cent of the Chinese public opposed the use of additives, in a nationwide poll on flour whiteners. 'We will stop adopting any unnecessary food additives,' Health Minister Chen Zhu told a press conference, held during the ongoing plenary meeting of China's parliament, the National People's Congress. 'The research into food additives will be halted because developers will worry about the government's reluctance to approve new additives,' says Dong. Although food additive levels are being abused, Dong still suggested that any ban should be made cautiously and with more evidence. When there is no clear evidence, the best option is to highlight the use of controversial additives in food and let consumers make their own choices, he says. Scientists in Japan have made an electrode for a lithium-air battery using a pencil. 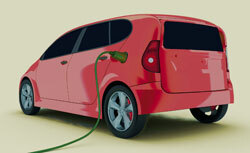 The advance could bring efficient, environmentally friendly and safe batteries for electric vehicles a step closer. Lithium-air batteries have the potential to produce enough energy to power an electric vehicle, but the amount of energy is a safety concern. Contamination in lithium batteries can result in unstable and high energy reactions, and the current lithium-air batteries are vulnerable to decomposition and burn-out. 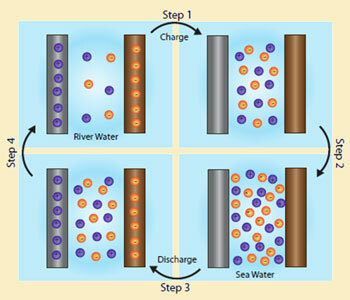 During the discharge process, lithium at the anode surface is converted into lithium ions. 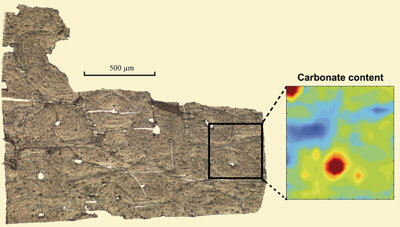 Simultaneously, lithium ions in the electrolyte solution pass across the ceramic layer and combine with oxygen in the air to form LixOy within the pencil trace. The battery was able to go through 15 charge-discharge cycles without losing its capacity. This is a lower number of cycles than current batteries, but the design promises a much higher potential energy and can be recharged simply by redrawing the cathode with the pencil. 'Using a solid state electrolyte suppresses detrimental side reactions encountered when using liquid organic electrolytes, improving cyclic stability,' explains Leela Mohana Reddy Arava, an expert in lithium battery technology at Rice University, US. 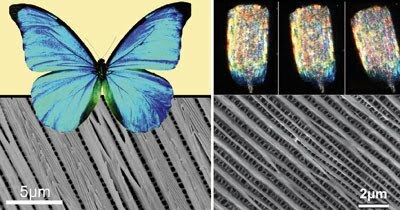 He adds that 'drawing electrode materials onto the surface of a solid electrolyte is an innovative approach'. Zhou and Wang intend to improve their battery's recyclability, making recharging more efficient. Scientists from Spain have used a lab on a chip device to quickly analyse levels of zearalenone, a contaminant, in infant foods with a detection limit below legislative requirements. Alberto Escarpa and his team from Alcala University, in Madrid, have made a microfluidic device that can detect zearalenone levels to 0.4ug/l-1, well below the maximum legal amount of 20ug/kg-1. Zearalenone is a metabolite from fungi found in cereal crops, such as maize, barley, oats, wheat and rice. 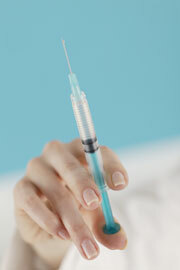 It can be a risk to humans because it causes infertility and has been linked to cervical cancer. 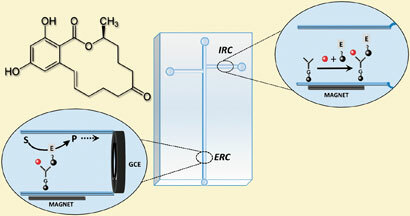 Current methods used to detect the compound involve two separate steps - an immunoassay followed by detection using techniques such as thin-layer chromatography or mass spectrometry. 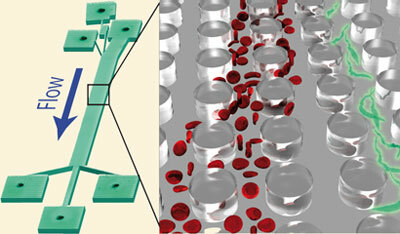 Escarpa's team designed a microdevice that combines the two stages in two separate chambers on a glass microchip. They injected a food sample into an immunological reaction chamber where zearalenone, in the sample, competes with an enzyme-bound zearalenone in the system to bind to antibodies attached to protein-coated magnetic beads. The beads were then guided towards an enzymatic reaction chamber using a magnet. Here, the enzymes catalyse an oxidation reaction. The response current produced is proportional to the enzymes' activity and also to the amount of zearalenone in the sample. 'Such lab on a chip devices are important from the standpoint of saving time, money and expensive reagents and don't need a skilled operator,' says Escarpa. This highly sensitive and selective chip, he adds 'avoids the laborious and time-consuming procedures associated with conventional immunoassays'. 'This is useful for a problem that is otherwise quite expensive to solve. Usually, the food has to be taken away to be analysed, which takes a long time, but this device can do it in a few minutes,' says Martin Pumera, an expert in electrochemistry and biological chemistry at Nanyang Technological University in Singapore. He adds that as the detector has been miniaturised, it could be integrated into a mobile phone sized device, increasing its applicability. In the future, Escarpa hopes to automate the sampling and sample pretreatment steps too. Materials chemists in China have developed a compound that they believe should improve the quality of field emission displays (FEDs), bringing applications a step closer. FEDs have, for a number of years, been a promising technology for flat panel displays, but progress has been hampered by the display quality. Jun Lin at the Chinese Academy of Sciences, Changchun, and colleagues developed a phosphor with promising colour properties for FED applications. Phosphors are materials that emit light of a particular wavelength when struck by an electron. They have long been used in cathode ray tubes, and have more recently found application in FEDs. 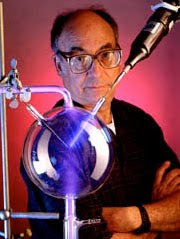 These work by a very similar principle to cathode ray tubes, but instead of a single electron source, a grid of tiny electron sources is used, making flat-panel displays possible. FEDs have numerous advantages over other flat panel technologies, such as the plasma and liquid crystal displays commonly used in TVs and computer monitors. These advantages include lower energy consumption, wide viewing angle, good contrast ratio and wide working temperature range. However, the phosphors for FEDs need to work at lower voltages than those in cathode ray tubes, and developing low voltage phosphors with suitable colour characteristics has hindered uptake of the technology. The phosphor developed by Lin's team is based on Mg2SnO4, previously known as a good base material for phosphors. By doping it with Mn2+ and Ti4+, they created a phosphor with a pure blue colour that works at low voltages. 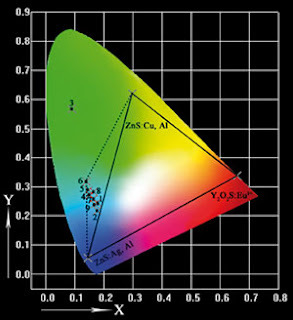 Lin says that the colour emitted is out of the range of the FED phosphors developed so far, giving it 'potential to increase the display quality of full-colour FEDs'. Importantly, he adds, the colour could be adjusted from green to blue simply by changing the concentrations of the two dopants. Lin concludes that 'FEDs have been recognised as one of the most promising technologies in the flat panel display market,' and that improvements such as theirs will 'make the technology more viable in the future'. Markku Leskelä, an inorganic chemist at the University of Helsinki, Finland, says that 'blue colour is one of the limiting factors in fabrication of full-color field emission displays, and this is an interesting new material, which has potential.' However, he also notes that the stability would need to be improved for practical applications. 'The 8 per cent decrease in intensity observed over one hour would be a problem in real devices,' he says. The oil slick in the Gulf of Mexico last summer provided a unique opportunity to study, in the field, the air quality effects of two widespread types of pollutants. Analysis of atmospheric data suggests that emissions of intermediate volatile organic compounds (IVOCs) and semi-volatile organic compounds (SVOCs) were low compared with those of volatile organic compounds (VOCs). But crucially those emissions led to the formation of microscopic aerosol droplets, a finding that could affect how these pollutants are managed in urban settings. 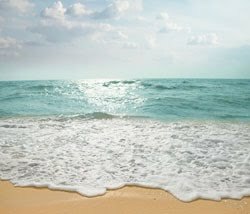 The Deepwater Horizon drilling unit, owned by oil super major BP, blew out on 20 April 2010, and by mid-June, the gushing well had generated an oil slick over 100 miles wide. On 8 June, and then again on 10 June, five scientists from the National Oceanic and Atmospheric Administration (NOAA) shared a plane with over 20 chemical instruments on a looping tour of the slick, collecting air quality data. 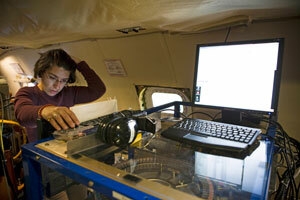 A few of these instruments measured organic compounds and organic aerosol concentrations. Commenting on the research, Hugh Coe from the University of Manchester says 'it's been very difficult to unpick the roles of these intermediate volatility compounds from those of higher volatility compounds.' 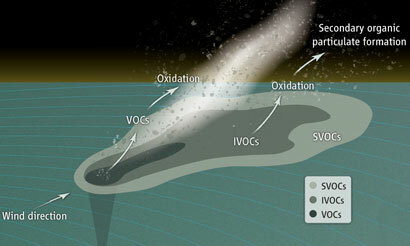 IVOCs tend to be produced together with VOCs and SVOCs in, for example, the combustion of fossil fuels. They are also naturally produced by forests. According to Joost de Gouw of the NOAA, by the time IVOCs condense into microscopic droplets, they have typically acquired functional groups, or otherwise combined, until only about ten per cent of the original compounds are identifiable. The Deepwater Horizon slick separated the volatile compounds as it spread, creating an ideal study site. VOCs are relatively small molecules, typically containing fewer than 10 carbon atoms, and the ones from the slick evaporated within ten hours. With between 10 and 20 carbon atoms, the IVOCS required between 10 hours and four days to get airborne, and the SVOCs, with over 20 carbon atoms, took even longer. In the atmosphere, however, the IVOCs and SVOCs condensed into droplets. The data taken on the plane suggests that, downwind of the spill site, the amount of organic aerosol increased, as did the typical droplet mass - indicating that the freshly-evaporated hydrocarbons formed an aerosol. Matching their data to a simulation of hydrocarbons evaporating from the oil slick, the team found that alkane chains containing 14 to 16 carbon atoms were probably the greatest contributors. These molecules have higher weights than most environmental laws address, and de Gouw says that the IVOCs particularly merit further investigation. 'What we need to do next is focus on these species and determine how this chemistry works in urban air,' he says.